The design is based on the most common rumors about the device and a healthy dose of imagination. 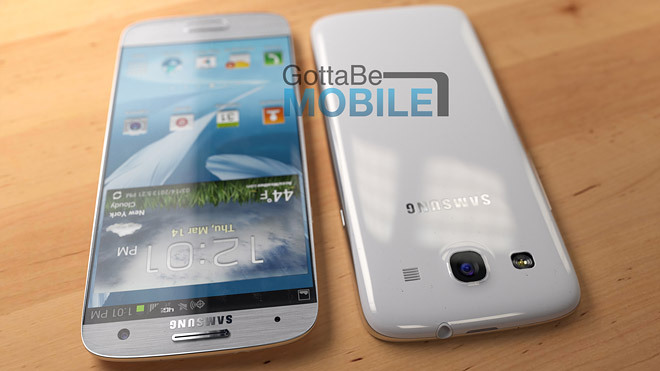 The concept follows the Galaxy S III design but takes cues from the Note II and Note 8.0. The major change is the almost bezel-less display – the concept fits the 4.99″ 1080p display in just 136.7 x 64.8 x 7.9mm, that’s smaller than the Galaxy S III and not much bigger than the iPhone 5. Check out this video which shows more renders and goes over GottaBeMobile‘s reasoning behind the design choices of the Galaxy S IV concept. Meanwhile, some alleged Galaxy S IV screenshots cropped up. Yes, again. They include shots of Quick System Info pro, which points to a 5.01″ 1080p with 480ppi pixel density. At least one of these numbers is wrong – 5″ 1080p phones have 441ppi pixel density, while 1080p at 480ppi results in a 4.6″ screen. The CPU is a quad-core ARMv7at 1.8GHz. Note that if this is a big.LITTLE design like the Exynos 5 Octa, only four cores are visible to the OS at a time, while the other four sleep to preserve energy. Note the little tab over the CPU specs, this could be for Multi Window like on the Galaxy Note II. 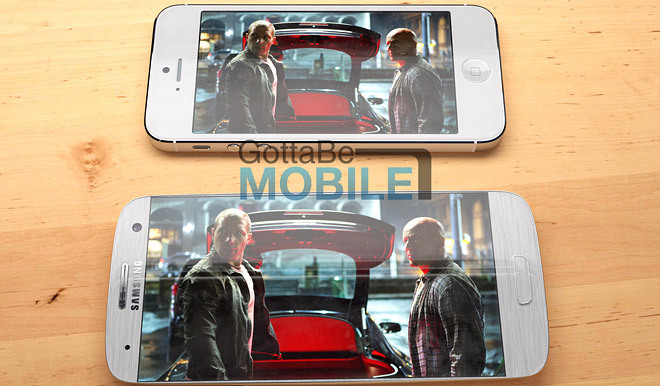 The camera screenshot reveals 13MP maximum resolution, but no other big differences compared to the Galaxy S III. The homescreen screenshot looks pretty much the same too. The status line on top of the screen shows 4G (LTE), Smart Screen features (Smart scroll and pause) and NFC. There’s no way to tell how accurate the Galaxy S IV concept render is – it seems a bit too aggressive with the side bezel of the screen (some really accurate software will have to recognize and ignore all the accidental touches) while being too conservative with the changes. Bezel aside it’s barely different from the S III. As for the screenshots, they seem fishy – a screenshot is not hard to fake, they have some wrong numbers and they show nothing new. Well, it’s only a week before the official announcement, until then our only reliable source of info are the teaser ads from Samsung. The first one is out already and we expect more soon. Too bad they probably won’t reveal anything major.